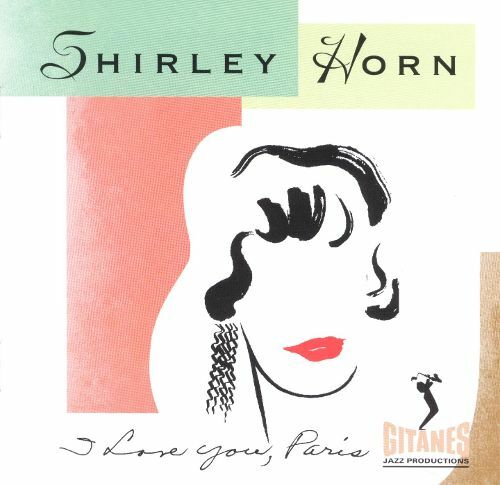 bebop spoken here: CD Review (retro): Shirley Horn - I Love You, Paris. CD Review (retro): Shirley Horn - I Love You, Paris. Shirley Horn (piano/vocal); Charles Ables (bass); Steve Williams (drums). As Simon Spillett said in his observations on Bebop Spoken Here, this isn't a retro-site. We try to concentrate on the present without ignoring the future or forgetting the past. However, when I popped into my local charity shop seeking shelter from the storm and saw a CD by Shirley Horn alongside discs by Harry James, Bix, Sinatra, Astrid and Sting, it was as if I was the drowning man seeing his life flash past - well it was raining heavily - so I thought I'd best have a 50p pop on Shirley and Astrid before it was too late. Fortunately, the storm eased and I lived to listen another day. I've yet to sample Astrid's offering but Shirley's 1992 live recording in Paris should be on everyone's bucket list. After all, seeking out a 1992 CD isn't like searching for a V disc by the Flare Path Orchestra nor is it as fraught with danger* You can probably find it on Amazon although not for 50p and the pleasure can't compare to finding it in a charity shop whilst sheltering from Storm Ali! Shirley Horn was possibly the most enigmatic jazz vocalist of them all. Over-praised by some and under-praised by others but as emotional a singer as any of her contemporaries. Sinatra lived the lyrics and no one did it better when he did and yet, he could also destroy them. Likewise Ella. Shirley Horn managed to create an individuality so unique that you took her voice to bed with you. Man, woman, or child, if she cried, you cried. Wouldn't it be Loverly? ; Just in Time; He Was Too Good To Me; Do it Again; Old Country; It's Easy to Remember; All Through the Night; L.A. Breakdown; I Loves You Porgy/Here Comes De Honeyman; A Song For You/Goodbye; That Old Devil Called Love. *See forthcoming review of a novel from the series featuring the Vinyl Detective - Victory Disc by Andrew Cartmel. Lance coincidentally I listened to a tribute to Shirley Horn on Radio 3 on Saturday gone. First time I have heard quite a lot of her music. A supreme master of the ballad . Impressive!!!! !